Hurricane Matthew is “not a threat to Bermuda at this time,” the Bermuda Weather Service said today, with its closest point of approach to Bermuda within 72 hrs forecast to be 1079 nm to the south-south-west at 6am on Monday, October 3rd. The latest forecast from the U.S. National Hurricane Center says, “At 8.00am AST, the center of Hurricane Matthew was located by an Air Force Reserve Hurricane Hunter aircraft near latitude 13.8 North, longitude 70.3 West. 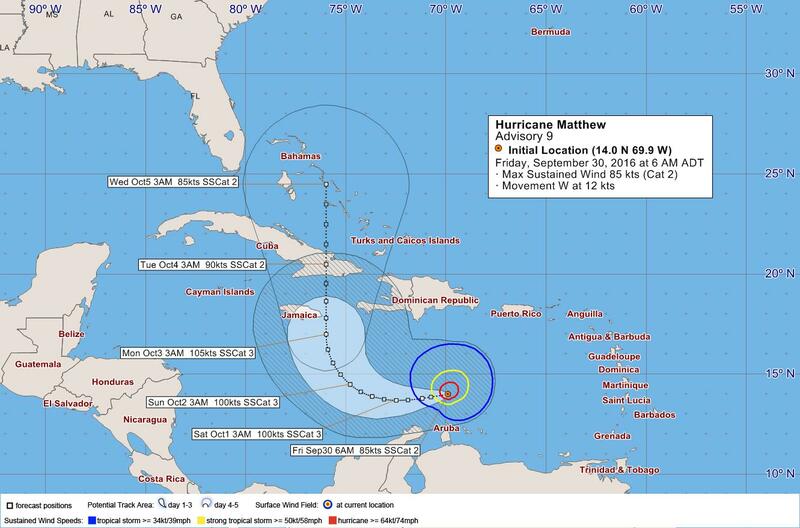 “Matthew is moving toward the west-southwest near 14 mph [22 km/h]. A turn toward the west is expected later today, and this westward motion with a decrease in forward speed are forecast through Saturday. A turn toward the northwest is expected Saturday night or Sunday. “Data from the aircraft indicate that maximum sustained winds have increased to near 105 mph [165 km/h] with higher gusts. Additional strengthening is forecast during the next 48 hours, and Matthew could become a major hurricane later today or tonight. Check back next Thursday…different story then!